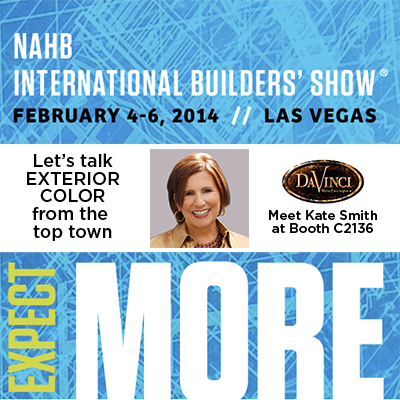 Kate Smith returns to the International Builders Show to talk about FRESH Colors for Home Exteriors at the DaVinci Roofscapes booth #C2136. If you would like to schedule an interview or just stop by to say hello, please drop us an email so Kate holds time in her schedule. On Tuesday, February 3rd at 12:45 you can see Kate speaking live with husband-and-wife hosts Mark & Theresa of My Fix It Up Life. These interviews are always crazy fun and packed with great tips and color advice. It would be even more fun if you were with us live! Interested in what trends you might be seeing at the show? Read Kate’s article The Top 10 Home Building and Remodeling Trends for 2014.